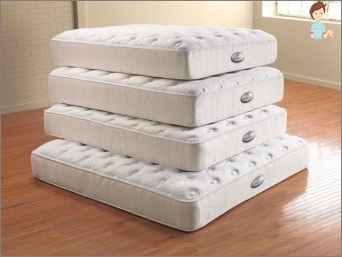 Home / Housework / Choose a mattress: a classic on the springs or orthopedic? Choosing a mattress: a classic in the spring or orthopedic? Quality of our daily life, well-being andCheerfulness throughout the day directly depends on how fully we rest during sleep. In this respect, the pose for sleep and the atmosphere in the room are important, but the crucial role is played by the surface on which our body spends from 6 to 10 hours of night rest. It's about the mattress for the bed. Orthopedists around the world say the following: Many health problems related to the musculoskeletal system could be solved by choosing the right surface for sleeping, or simply - a mattress. Which is better to choose an orthopedic mattress toHe met the requirements of hygiene, the type of figure and fit in size? Having learned the answer to this question, you will be able to provide yourself and your loved ones a healthy sleep without nightmares and an excellent sense of rest in the morning. Classic or springless mattresses - what is better for you? The mattress is an elastic support consisting of supporting layers of materials. It can be natural and artificial fillers with different hardness and density. For strength and as long as possible in classical mattresses, the system of metal springs provides support. Before their invention, mankind rested either onMultilayered beds (layers could be woven mats, furs, woven and felted carpets), or on feather beds, stuffed with birds' feathers and feathers, wool, cotton, hay and even dry algae. The appearance of springs has solved several problems at once: this bed does not accumulate moisture, does not require daily whipping, and surpasses other types for convenience. But very quickly the shortcomings of "Mass models at democratic prices"- on them the body in the dream unnaturally flexes, mainly in the lower back, and the springs themselves deform and press into the most different parts of the body. Not to mention the characteristic squeak, which also prevents sleep. But the so-called elite spring mattresses, whose cost is an order of magnitude higher, are still considered (and probably will be considered) the best in terms of their supporting properties and durability. The fact is that today the number of springs per square meter of quality mattress is no longer calculated in units, but in hundreds of pieces (even up to 1000). This design takes a very good shape of the human body, regardless of the weight of the sleeper, and it is a pleasure to rest on such a mattress. However, their cost is almost always very high. Some manufacturers, together with orthopedic doctors, did not bring the spring system to perfection, but went quite another way. Today, mattresses made of resilient materials that do not require a metal frame and are cheaper than spring ones of the same quality level have become a good alternative. Are not available for insect parasites (synthetic). The disadvantages can be attributed to the fact that in the summer on themIt's hot enough to sleep, because the dense texture of artificial materials, although it "breathes", but strongly delays heat. Some models are generally better to use only in the bedrooms equipped with air conditioning. Going to take care of health and acquiringA new mattress, explore the potential purchase with all the care - it will depend on it, whether you get a long-awaited solution to problems with the spine or just throw money away. Memory - a special design, very quickly adapts, when you change the pose in a dream, while not bending deeper than necessary, perfectly supports. Based on these characteristics, evaluate what is more important for you, how much you have, and when the next time you can replace the mattress. These issues are better solved before acquiring it. Do not be lazy to lie down and turn on your potential purchase. Whatever the label praises, it will be up to your body to feel comfortable. For preschoolers can be low from latex and coconut coir. The width of the mattress takes into account the norms of berths. 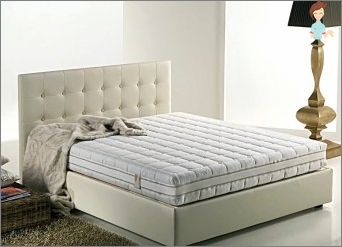 Single mattress should have a width of at least 80 cm, most companies produce a standard of 90 cm. The one-and-a-half will be 120 cm wide, the double ones are 140, 160, 180 and 200 cm. The rarer round models are produced with a diameter of 200-220 cm. The length is also standardized for all companies - 200 cm are suitable for almost everyone. For very high people, some manufacturers have the opportunity to assemble a mattress to order for your parameters. How to calculate the length in this case? It is believed that the optimal length is equal to your height plus 20 cm. However, experience suggests that it is better to take into account also your individual habits. So, if in a dream you constantly slide off the headboard, like to sleep at the bottom of the pillow, and your pillow itself has "Soviet"Size 60x60 cm, then the above calculation formula will be incorrect. It is better to calculate it differently: the growth plus the length of the pillow plus 10 cm - will be more convenient. A separate question - what should be the height. For a good long service it is crucial - the higher, the better and at the same time the product will be more expensive. Representatives of the luxury class, for example, have a height of up to half a meter. The standard for springs is about 20 cm. The sizes of orthopedic mattresses in heightVary, depending on the filler, from 15 to 25 cm. If it is assumed that the sleeper will be full, massive, it is better not to save and take the model higher. Bending, the material will retain its orthopedic properties. For lean the best choice is not tooA rigid mattress 15-18 cm high. High rigid orthopedic mattresses are inconvenient for people weighing less than 55 kg, as their surface tension is too strong and the material can not take the form of a body that is comfortable for rest. To ensure that your purchase has lasted longer, observe certain rules. 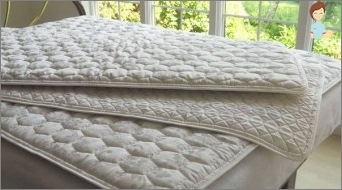 It is recommended to rotate and unfoldMattress from time to time, so that the springs or fibers of the filler are given the same load and not deformed. You can do this once a month, if you sleep alone, and once every two to three months - if you are alone. Some models have a winter and summer sides, in which the top layer and upholstery differ. In this case, it is enough just to unfold the mattress, changing the direction of the head and legs. Do not let children enjoy jumping onYour new mattress, because in order to withstand such a load, it must be with a spring mechanism of the elite category. Otherwise, humps will quickly appear on the surface, and it will be impossible to sleep on it. In orthopedic models, there is nothing to break, but here you should also take care of the material: its layers are adhered in a glue-free way, and "Landslides"From children's pranks may well spoil your holiday. The replacement should be selected after 3-5 years,The exception is expensive spring models, whose service life is much longer (10-12 years). If your choice is orthopedic, then extend the last of his years will help mattress pad thickness of about 5 cm. Comfortable mattresses and pleasant dreams!